Now Archived! PolarConnect event with Adeena Teres and John Woods from the Operation IceBridge Team on 24 April 2017. You can access this and other events on the PolarConnect Archives webpage. 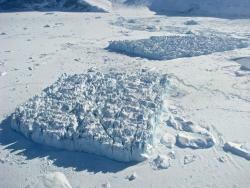 Icebergs the size of a city block in eastern Greenland. Photo by Russell Hood. IceBridge is in its 8th year as a NASA mission and is the largest airborne survey of Earth's polar ice ever conducted. IceBridge uses a highly specialized fleet of research aircraft and the most sophisticated science instruments ever assembled to characterize yearly changes in thickness of sea ice, glaciers, and ice sheets in the Arctic and Antarctic. The research team is experiencing first-hand the excitement of flying a large research aircraft over the Greenland Ice Sheet. While in the air they are recording data on the thickness, depth, and movement of ice features, resulting in an unprecedented three-dimensional view of ice sheets, ice shelves, and sea ice. Operation IceBridge began in 2009 to bridge the gap in data collection after NASA's ICESat satellite stopped functioning and when the ICESat-2 satellite becomes operational , making IceBridge critical for ensuring a continuous series of observations of polar ice. IceBridge flies over the Arctic and Antarctic every year - in the Arctic from March to May and the Antarctic in October and November. By comparing the year-to-year readings of ice thickness and movement both on land and on the sea, scientists can look at the behavior of the rapidly changing features of the polar ice and learn more about the trends that could affect sea-level rise and climate around the globe. Support for a teacher on this project is provided through separate funding to ARCUS through NASA. More information about IceBridge can be found at the NASA project website. 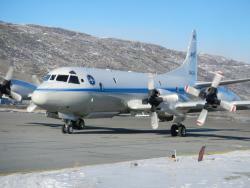 NASA's P-3 Orion for Operation IceBridge. Photo by Russell Hood. The field campaign for Operation IceBridge is based out of Kangerlussuaq in western Greenland, and Thule Air Force Base in northwest Greenland. Kangerlussuaq was once used as an American military base, the settlement is now Greenland's main air transport hub and the site of Greenland's largest commercial airport, and Thule is a fully operational U.S. Air Force Base, run by the Danish company Greenland Contractors. The climate in Kangerlussuaq and Thule is arctic, with temperatures ranging from -25 to 18 degrees Celsius throughout the year. Russell Glacier highlights some of the natural beauty that can be reached out of Kangerlussuaq, while Thule has lots of historical cold war Air Force sites included missile silos and ice field bases. The research team is living in the Kangerlussuaq International Science Support Building (KISS) and the Air Force Inn in Thule. Poster presentation about teachers and researchers working together as participants of the PolarTREC program and the benefits to both. The poster outlines my experiences as a PolarTREC teacher working with Operation IceBridge. PolarTREC teachers Steve Kirsche and Adeena Teres presented to a group of teachers from around the state of Florida. This is the presentation that they gave at the 2017 Florida Association of Science Teachers (FAST) Statewide Conference on 20 October. Interview with PolarTREC teacher Adeena Teres in the Kappa Alpha Theta Magazine. Adeena is an alumni of the Zeta Kappa Chapter. Adeena Teres is further recognized with a proclamation from the Broward County Commissioner Michael Udine shown in local online publication "Coral Springs Talk". An article in the May 2017 issue of Parklander Magazine which talks about Adeena Teres' trip to Greenland with Operation IceBridge and how she plans to use what she learns in her classroom. Article about Adeena Teres receiving an honor from the county commissioner for participating in NASA's Operation IceBridge. WPLG Local News covers teacher Adeena Teres who received a Proclamation for participating in Operation IceBridge. The proclamation was given at her school in front of one of her classes by Commissioner Michael Udine and June 2, 2017 was designated "Adeena Teres Day". PolarTREC teacher Adeena Teres discusses the 2017 Arctic Campaign of NASA Operation IceBridge from Kangerlussuaq, Greenland. Project Manager John Woods joins Adeena to explain what Operation IceBridge is and what they are measuring while flying over Greenland. Adeena Teres has taught science at Stoneman Douglas High School in Parkland Florida for the last nine years. She received her undergraduate degree in Marine Science from the University of South Carolina and her Master’s degree in Curriculum and Instruction from Florida Atlantic University. She believes in hands on learning and teaching through inquiry and she wants her students to look at the natural world and ask questions that they want to have answered. Adeena wants her students to learn how to think critically and to be stewards of the Earth. Several years ago, she ran her first half marathon and has been running ever since. She is obsessed with Disney and has combined her two hobbies by signing up to run every race Disney hosts at the property in Orlando, Florida. She is passionate about traveling both professionally and for fun and she is ready to take on new adventures. Adeena is excited about sharing this amazing opportunity with her students. Living in Florida, she is extremely experienced in watching snow fall in other states while she reads under the palm trees. It is her fervent desire to build a snowman soon. John Woods is currently NASA’s Operation IceBridge (OIB) project manager. OIB utilizes a highly specialized fleet of research aircraft and the most sophisticated suite of innovative science instruments ever assembled to characterize annual changes in thickness of sea ice, glaciers, and ice sheets. Prior to working with NASA, John served on Active Duty in the Navy for 14 years as a Meteorology and Oceanography Officer. His tours included the National/Naval Ice Center and United States Naval Academy. John completed his master’s degree in Operational Meteorology and Physical Oceanography at the Naval Postgraduate School and bachelor’s degree in Oceanography at the United States Naval Academy. Having deployed to the Polar Regions over 6 times, John has spent time in Alaska, Greenland, and the Southern tip of Chile for IceBridge missions. Education and Outreach has always been a passion, and introducing science of the cryosphere has always been a priority. John looks forward to working closely with PolarTREC educators in fulfilling this mission. I'm checking with the experts and will answer you soon. The amount of snow in Greenland varies depending on where you are but it snows mostly in December through March. Where I am staying there is only one small store. No Yetis. For one week all of the eggs and chicken was sold out of the grocery store. Besides they don't need Yetis there, it's freezing. I haven't found it yet but I am looking. I hope to see it one day.